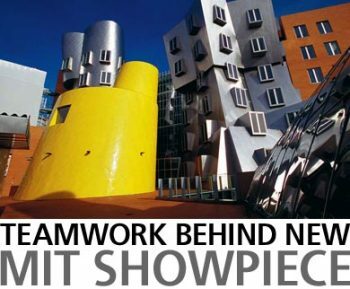 MIT suing Frank Gehry for design flaws, flooding, leaking, and dangerous icicle formation in the Stata Center in Cambridge. Do you want a wild and crazy building dreamed up by an artist? Stop and think whether all the less strange buildings look the way they do for a reason. It will not help the construction company, from whose site we borrow this photo, that they bragged about their teamwork with Gehry. The design itself? Looks just like any ordinary building, after one has eaten a few shrooms. And don't blame MIT - no engineers there. Shoddy and ugly as well. Modern art and architecture in a nutshell. I wonder why there isn't a gigantic cross in thousands of gallons of urine. The faculty senate surely would rise in ovation. Frank Gehry is proof that among intellectuals, we're way past "The Emperor Has No Clothes," and are now in the realm of: "The Emperor Has No Clothes And No Genitalia And His Pasty-Skinned Stick-Like Appendages Are Being Moved Solely By His Brain Stem, Which Is Loaded With Porphyrins." Other than that, the building is a triumph. On that I'm sure we can all agree. One of Gramsci's stronger suggestions was to uglify public spaces under the ''art'' rubric --in order to confuse & demoralize us average joes about our own abilities to make value judgements. Of course, when one finds oneself agreeing that something is valuable and beautiful on the grounds that everyone says it is rather than on the grounds that it creates a high emotion in one's own self, one is losing faith in oneself, fading one's own identity. Becoming riper fruit for the Borg. on uglifying public spaces (or any online article discussing the same...it would seem a prime topic for the Criterion online eZine ). i have no trouble linking it to Gramsci's other destructive prescriptions in kind,but i've not come acros a specific discussion(s) on that Gramscian topic before. to large scale projects that typify the modern city. human-scale is one of the common casualties. good built environments are hard to achieve. bad built environments are relatively easy. Wow. "They can close the blinds during those few minutes" --the perfect illustration of you-know-whatism. On the Gramsci--I'll have to think where i read that. It was in a discussion of 'revolutionary art', how the revolution must not cede art to bourgeois decoration (blah blah) but rather must forever co-opt the avant-garde (blah blah), and how large public artworks for public spaces could advance 'open-mindedness' (euphemism alert). If I can recall the source, i'll post it here--or elsewhere if this one has rotated out. will give it a read. Just because "they" i.e. designers, can draw it does not mean "we", i.e. builders, can (or should) build it. The Freedom Tower on the WTC site will prove to be, IMHO, a case that will illustrate that point. I think the many angles that are incorporated into the buildings design will make for a lot of waste of very expensive materials and result in large cost overruns. The extra time the trades people will need to cut and fit each different angle will be huge and the odd angles will very likely make the interior difficult and expensive to finish and furnish.